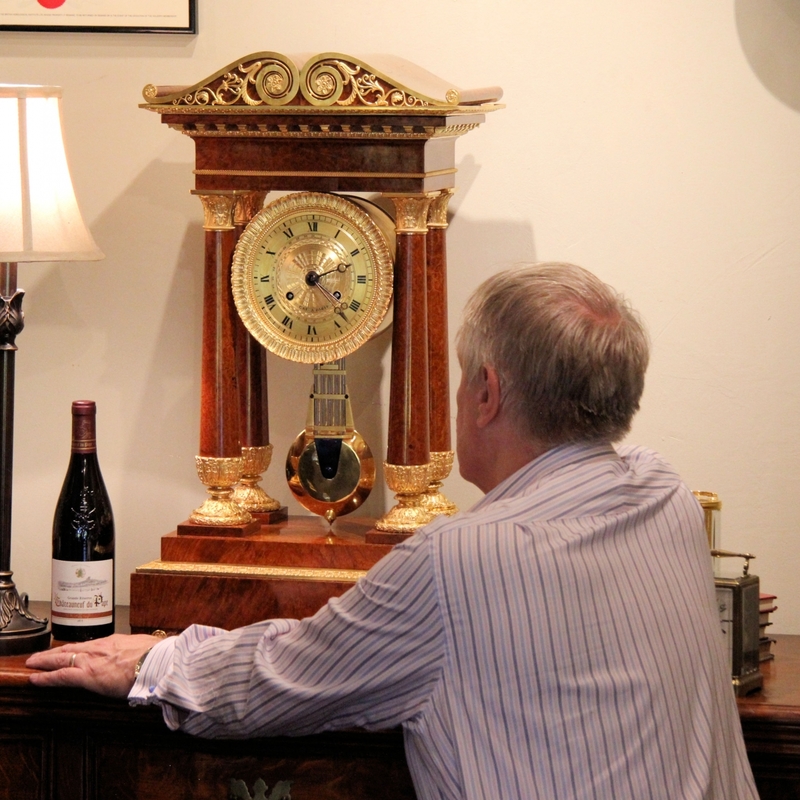 This clock can only be described as Stately and magnificent. 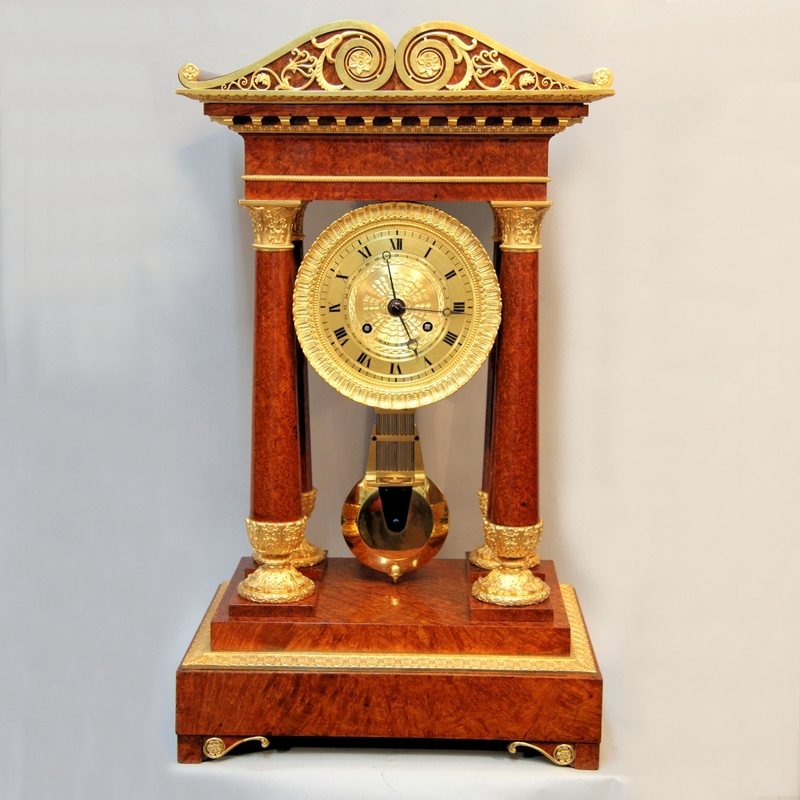 It has a circular eight day duration movement with Dead-beat escapement, large pallets and low count to the escape wheel. 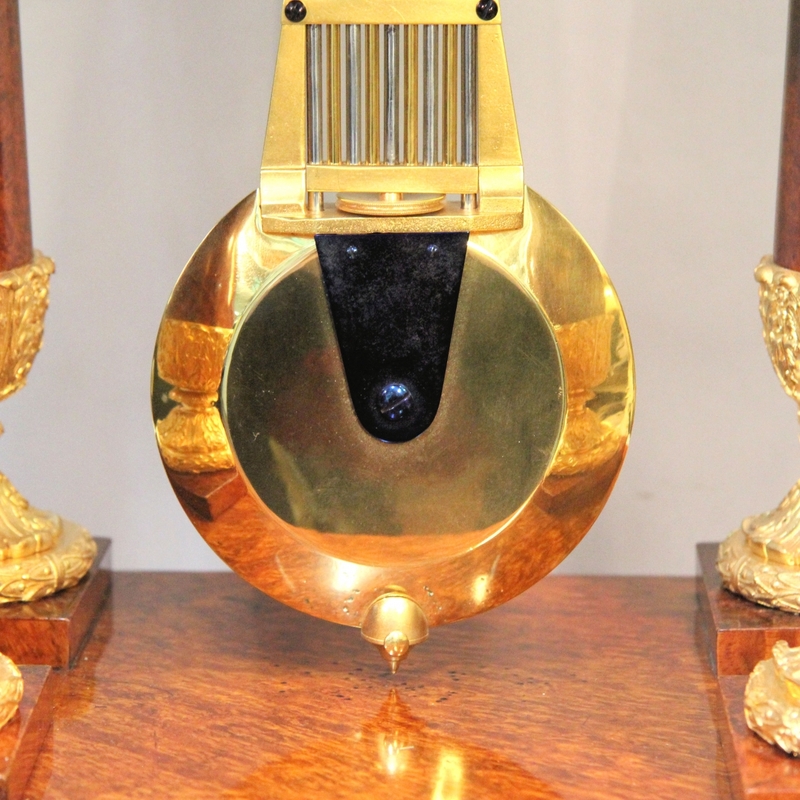 It has countwheel striking for the hours and halfs on a large tuned bell and drives a substantial, true Gridiron, temperature compensated pendulum with a large brass lenticular bob. The striking barrel drives a flagged pinion that operates the calendar star wheel every twenty four hours which indicates with a centre sweep hand. The movement front plate is stamped with the maker's mark "CAY". 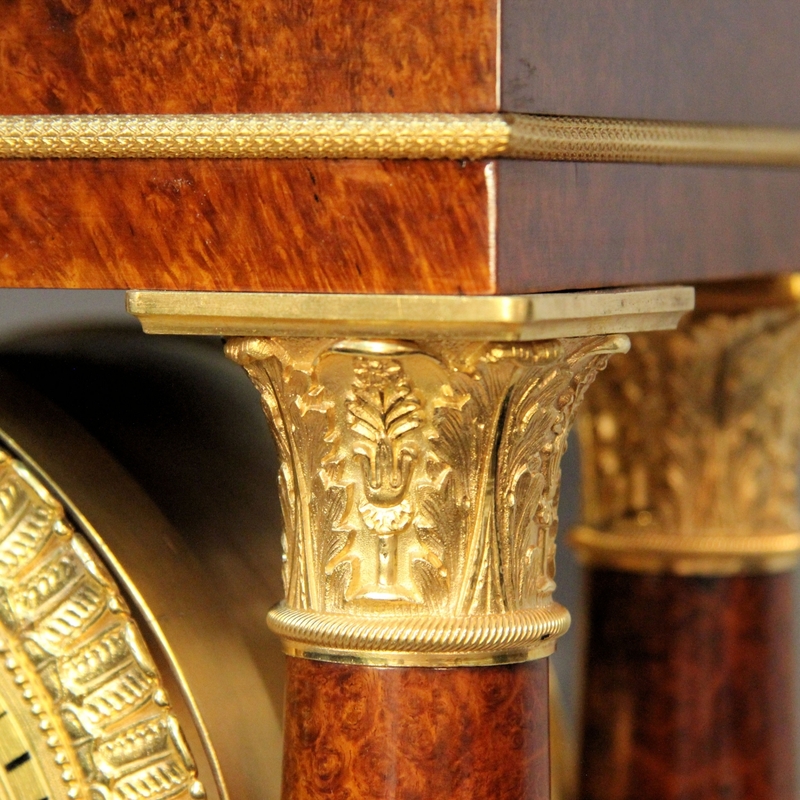 The movement is fixed within an enclosed ormolu drum with a finely cast ormolu bezel adorned with Acanthus leaves. 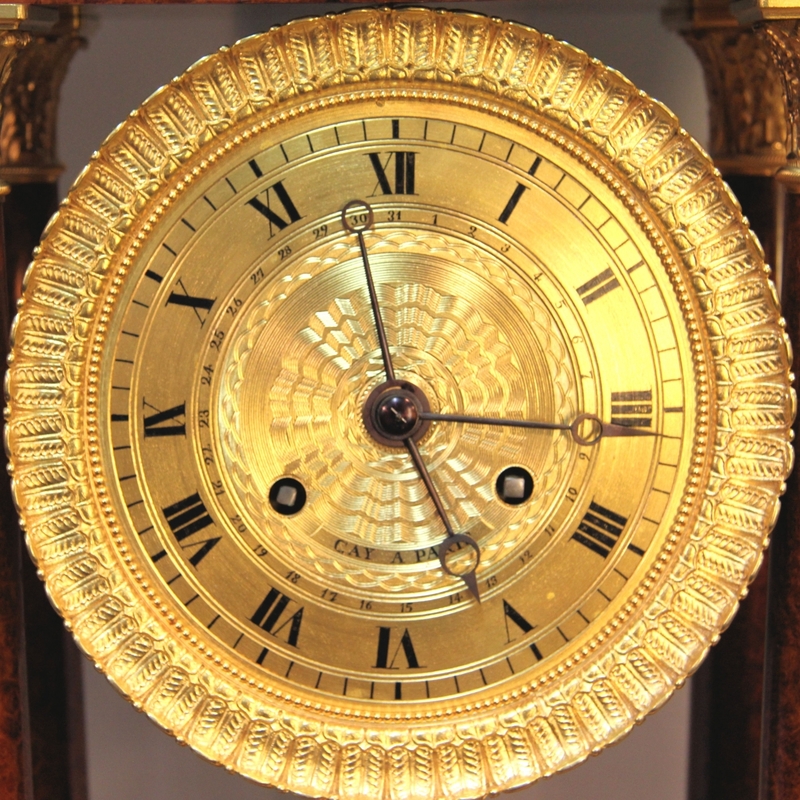 The 6 1/2" inch diameter, engine turned gilded brass dial has black Roman numerals, minute markings and a lower plain cartouche bearing the maker's mark "CAY A PARIS". 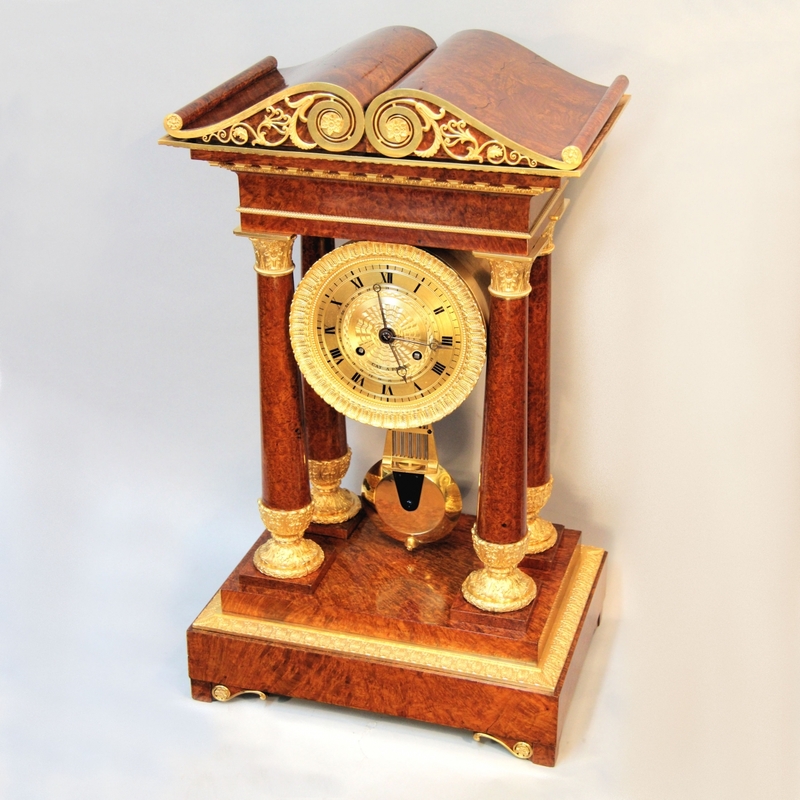 Within the hour chapter are the Arabic calendar numerals for the sweep hand. All three hands are blued steel 'Open moon' style. 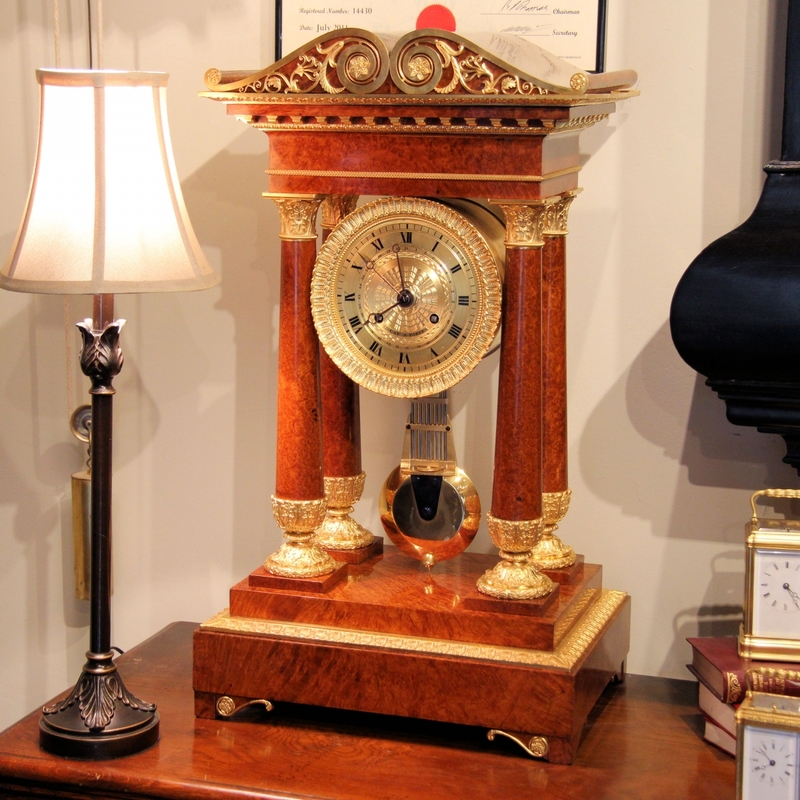 It retains its original large winding key. 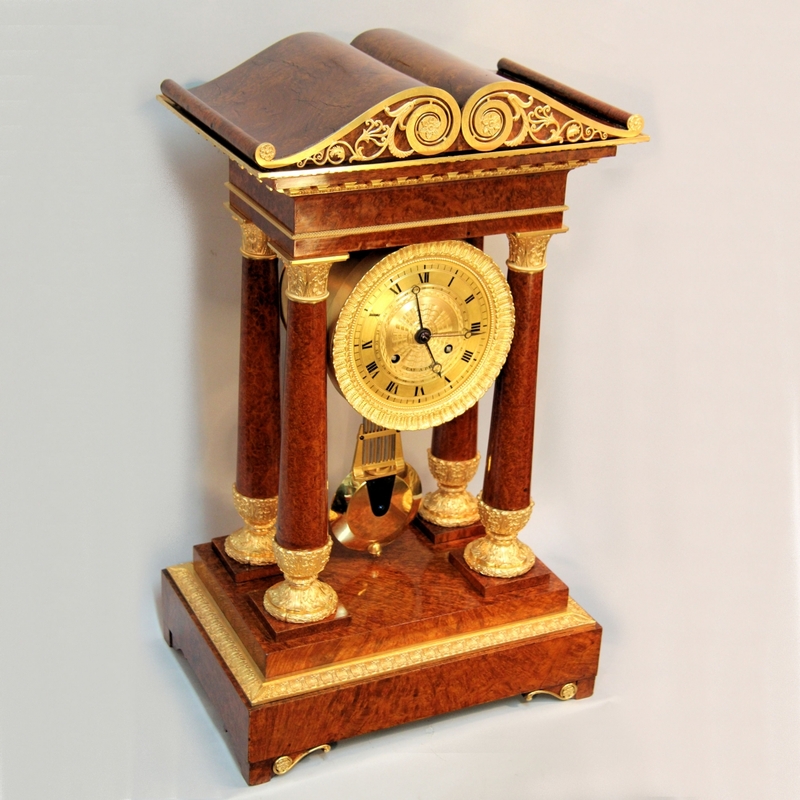 The large, four pillar 'Portico' case is veneered in carefully chosen Amboyna wood and adorned with finely cast ormolu mounts. 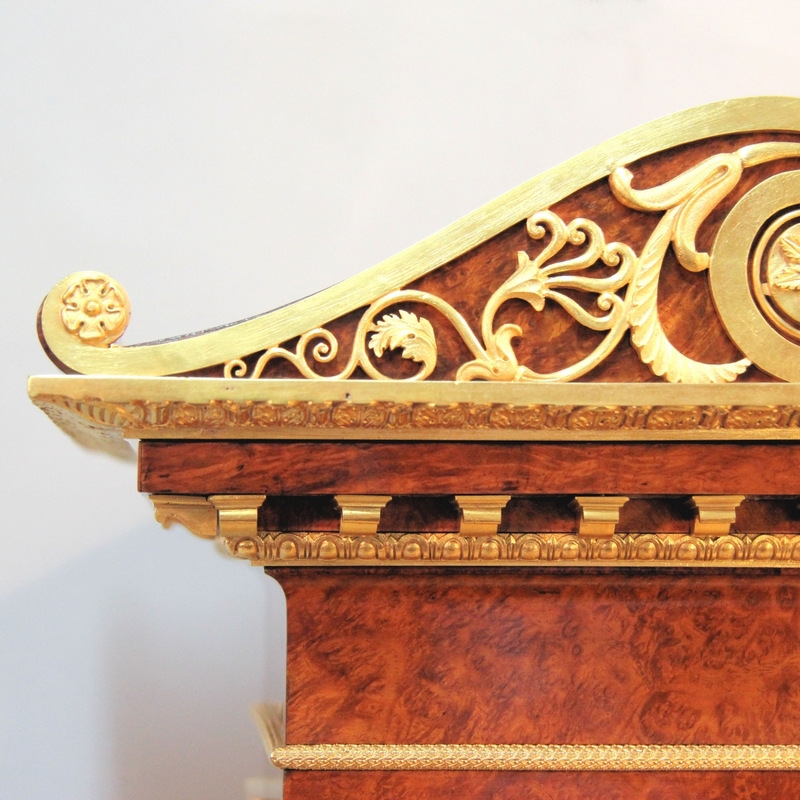 The top is of double scrolled 'open book' style and is fronted with a shaped ormolu fret of classical Grecian style. 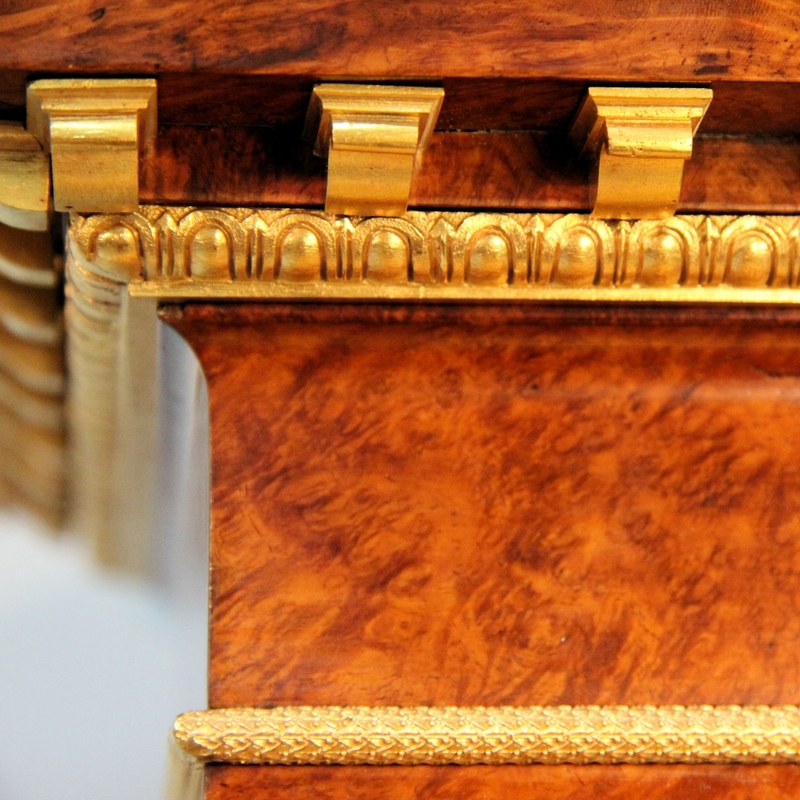 The classical style follows throughout the case and the pediment is constructed in Palladian style with shaped ormolu protruding rafters. The pediment is held aloft on four tapering pillars that have Doric top capitals and Acanthus lower capitals. 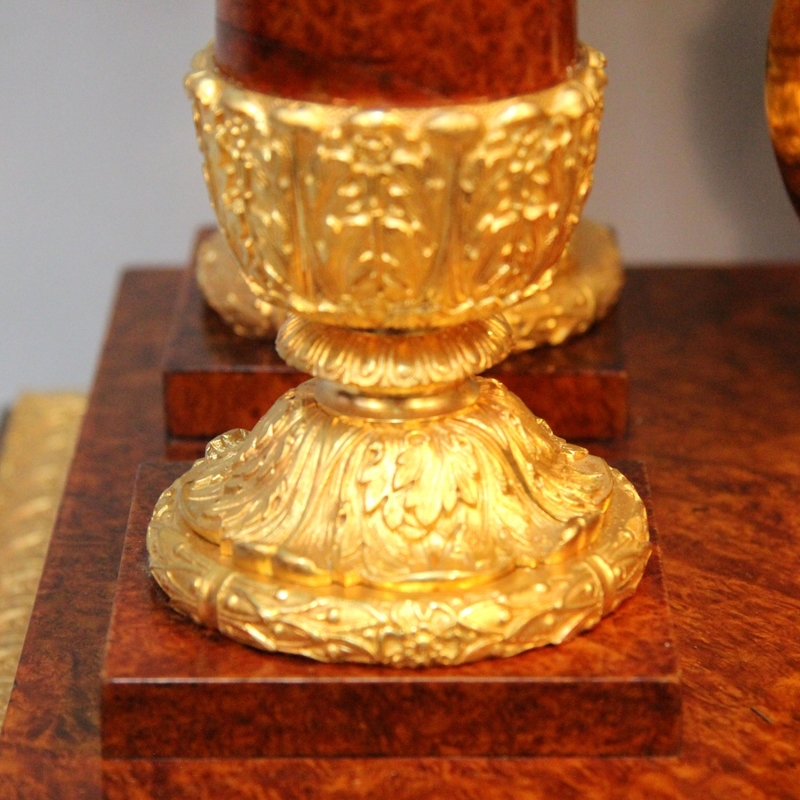 They stand on a stepped base with further Acanthus ormolu moulding and scrolled, block feet. 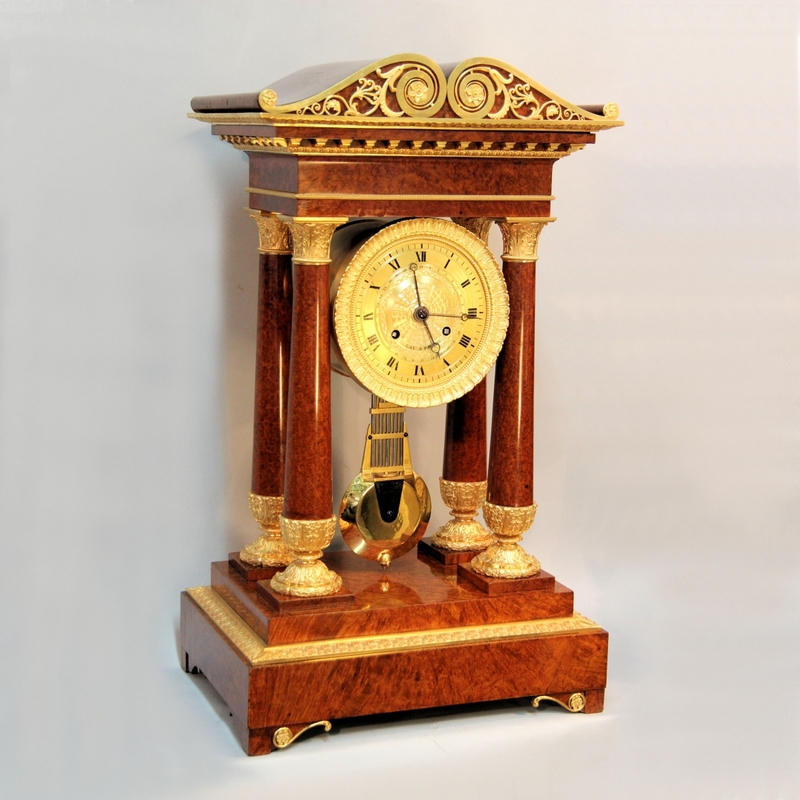 * This probably unique Portico clock is the finest that I have ever seen, there is nothing to compare it to and it must have been commissioned for a palace. There seems to be no records of the maker and there are no other indications anywhere on the clock. Perhaps this was intentional because it was shortly after the French Revolution and caution was taken with ornate items! 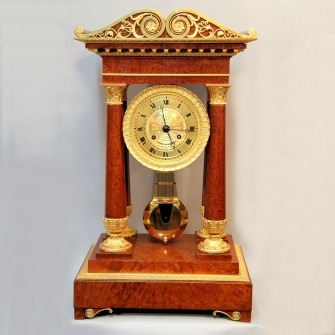 Clocks such as this simply don't appear on the market and would be almost impossible to obtain, it would be fitting for this one to be placed in an important house so that it's splendor could be truly appreciated. Dimensions: 29" high x 17" wide x 12" deep.